These tips on mobile meditator cushion show you how easy it is to use so that you can get right to meditating with no lost time. Great meditation gift idea! Doing something well requires using the right tools. The right tool for meditation is a meditation cushion or seat that will work just for you. 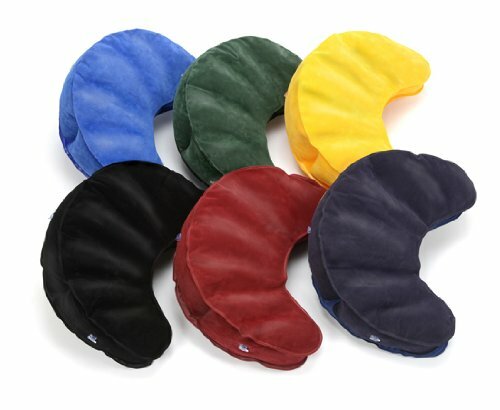 Finding that perfect meditation cushion for your meditation time can be difficult, especially with all the different options available. The best cushion is one that can be adjusted to your needs. 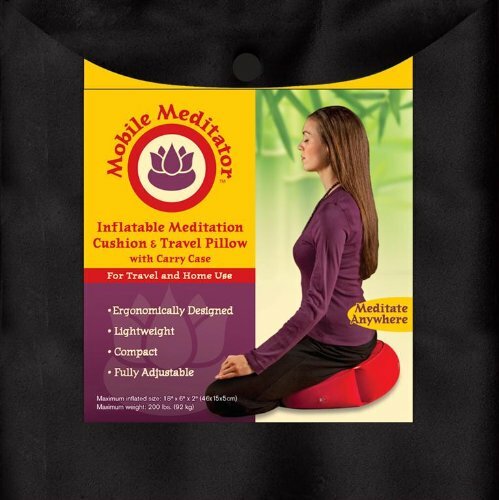 The Mobile Meditator inflatable meditation cushion and travel pillow has been improved to be even better and stronger. Unlike other inflatable mediation cushions, the Mobile Meditator, designed in a crescent-moon shape, has three separate, adjustable air chambers. The size, comfort and stability are customizable. The Mobile Meditator was produced for comfort and convenience. The cushion is light-weight, weighing only 13 ounces. The cushion dimensions measure 18 inches by 12 inches by 6 inches. It can deflate easily, and inflate smoothly as well. In addition, you can toggle the side chambers for hip and thigh support. Note: the maximum inflate size is 18 inches wide and 6 inches tall in the back and 2 inches tall in the front, or 46 centimeters by 15 centimeters by 5 centimeters. Traveling meditators rejoice! The Mobile Meditator is clearly designed by meditators for meditators. The cushion comes with a travel pouch, so it can travel with you anywhere, and it’s ideal to use as a second meditation cushion. Some people keep it in their office so they can meditate in comfort anytime they want to. And you can purchase the cushion in a variety of colors. The Mobile Meditator comes in blue, purple, black, green, and red. Even long-time meditators say without reserve that this cushion is the most comfortable one they have ever used. It’s designed to ensure your sitting bones are at the correct angle for a comfortable sit, even when sitting for extended periods of time. The Mobile Meditator is easy to wash with a mild detergent and a soft cloth, which is perfect for those who want to have a cushion to use while meditating outside. Take your Mobile with you anywhere: flying on a plane, hiking through the mountains, backpacking through Europe, camping, lounging at your favorite beach spot, attending a board meeting, or hanging out with friends. It is fully adjustable for your needs. It takes up about the space of a tee shirt in your suitcase, so you can have more room for other necessities instead of filling half your suitcase with a buckwheat-filled meditation cushion.